One of the things I appreciate about working at SparkFun is getting to be part of the Open Source community. I'm continually amazed and inspired by what folks are coming up with in their backyards, basements and work spaces. One open-source project that I just stumbled across while running down a rabbit hole on the internet is called Open -Ephys project.The project was started by two graduate students at MIT, in an effort to build more flexible and affordable tools for their research in the field of neuroscience. It's incredibly exciting to see that open source is having an impact at the university research level. 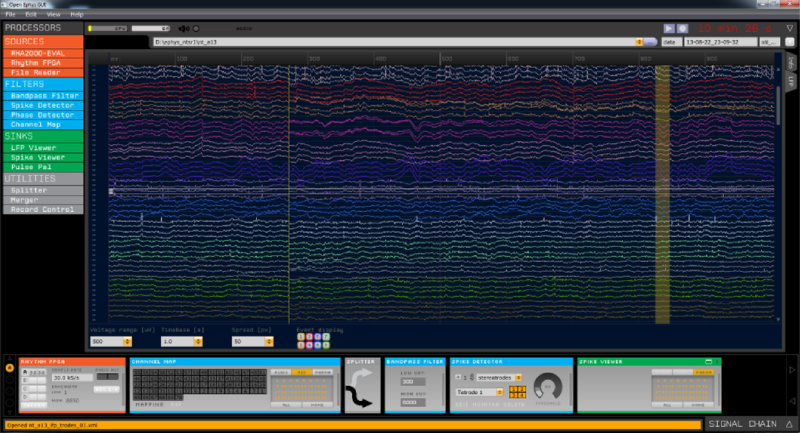 The main goal of Open Ephys is to create a fully open-source platform for recording electrical potentials from the brain. The founders of the project use [tetrodes](http://en.wikipedia.org/wiki/Tetrode_(biology) to listen to individual neurons while simultaneously manipulating their activity using optogenetic stimulation. A basic hardware setup for collecting 64 channels of neural data, based on tools designed and shared by Open Ephys. Two headstages (lower-right) digitize analog signals from the brain and send them to the acquisition board (top) via thin, flexible cables. An auxiliary input board (lower left) allows the data to be synchronized with external devices via digital triggers. All of these signals are collected by the acquisition board and sent to a computer via USB. I was lucky enough to get in touch with Josh Siegle and Jakob Voigts, the two main driving forces behind this project. They kindly let me pick their brains about the inception and growth of Open Ephys, as well as some of the difficulties they've run into along the way. What was the specific motivation for starting this project? We got started with open electronics out of necessity. Neuroscience is currently dominated by closed-source commercial hardware, which is often expensive and difficult to modify. Neither of us have any formal engineering training, but we were extremely driven to build tools that were optimized for our experiments. Our first project was a device for making electrodes for recording from brain tissue, which entails twisting four wires around each other. Someone in our lab had designed one many years ago, but it wasn't well documented and would have been hard to replicate (some of the components were obsolete). There was also a commercial version, but it lacked essential features and didn't produce electrodes that were up to our standards. So our lab bought a SparkFun Inventor's kit, with which we built the first prototype on a breadboard. After that we made a PCB version (with the help of SparkFun's Eagle tutorials). Now the final design is freely available, and has been built by a bunch of labs in addition to our own. It's much less expensive and, in our opinion, much higher quality than the equivalent commercial product. 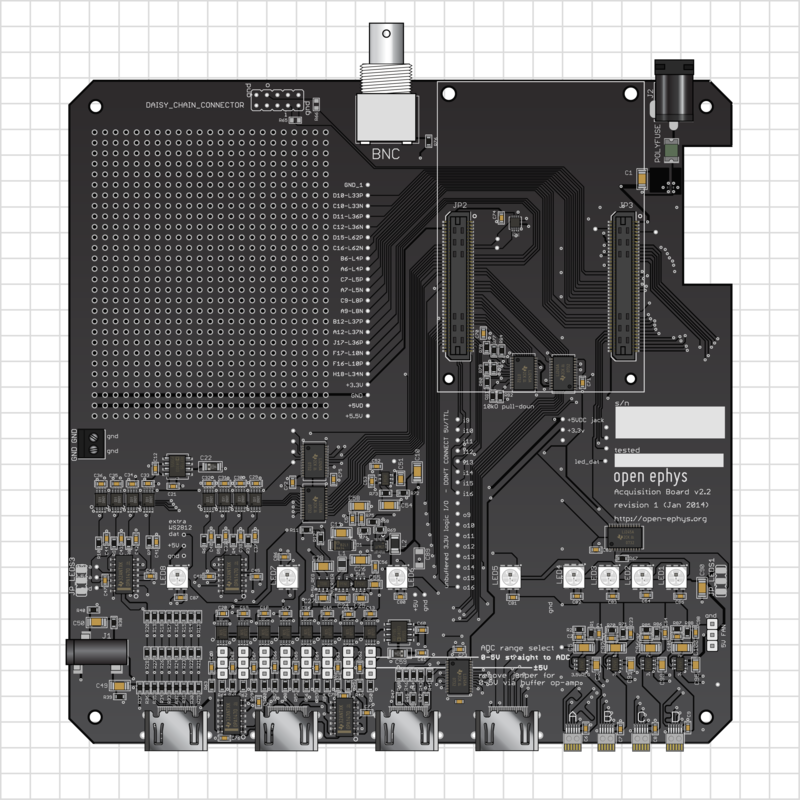 An illustration of the assembled Open Ephys acquisition board. The design and bill of materials are available on GitHub (https://github.com/open-ephys/acquisition-board). Designing the tetrode twister—and actually having it work—taught us that electronics is much more approachable than many scientists realize. In 2011, we embarked on a more ambitious project, which was to replace the bulky, inflexible commercial systems for digitizing neural data with an open-source version. We wanted to parallelize our experimental rigs in order to increase the throughput of our experiments. This wasn't financially tractable with the commercial systems, which cost upwards of $50,000 each. By leveraging new ICs for amplifying neural data, as well as an open-source library for data processing, the engineering component was greatly simplified. We were able to get a prototype up and running in a few weeks, and eventually created a more polished version that's been distributed to over 80 labs around the world. Some research institutes now have 10 or more systems running in parallel. How were you able to build research-quality tools and still find time to do science? Our main passion is carrying out experiments to better understand the brain. But it turns out that doing cutting-edge neuroscience these days almost always requires some amount of tool development. Since there are very few standards in the field, nearly everyone ends up writing code and building machinery to support their research. We decided early on to put in the extra effort required to make our tools modular enough and polished enough that they could be used by scientists other than ourselves. In the end, I think that conducting our development efforts out in the open actually saved us time. We got a lot of help from Reid Harrison, the founder of Intan, as well as from like-minded labs. As Josh said, we're mostly self taught, through online resources like SparkFun. The most important element that really allowed us to build research-qualitysuch a well performing hardware were the specialized integrated circuits from Intan Technologies. 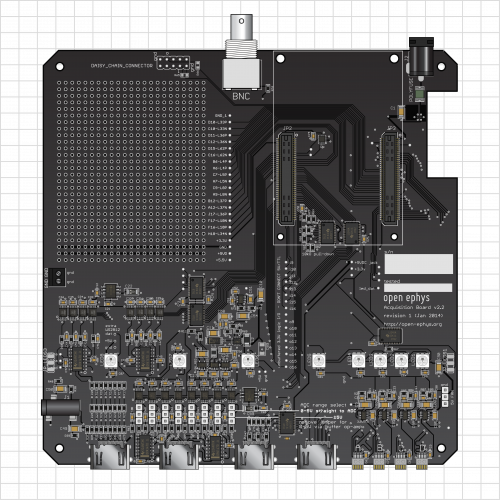 We also relied heavily on the user-friendly, well documented FPGA development boards from Opal Kelly. 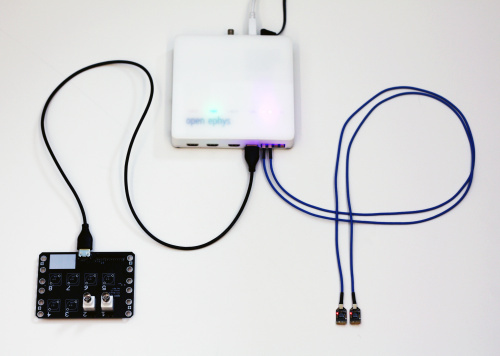 We couldn’t have put the system together if it hadn’t been for Opal Kelly’s easy-to-use libraries for USB communication. How has the collaboration element been for beta testing? Did you reach out to all of the univeristies? Have you had any interest fron medical/non-academic based groups? The beta testing was pretty informal. We used a handful of large donations to sponsor the shipment of acquisition boards to a bunch of labs with technical expertise. We had a request form, but most of our contacts were labs we already knew. Once they started collecting data with our system, they gave us feedback on the software and hardware. In response, we made a few updates to the designs, which improved the 100 boards we manufactured this spring. We've had some requests to use the device for medical purposes, but it's not appropriate for that. Our target audience is solely academic researchers, not clinical/commercial applications. In your experience, how well does the collaborative open-source approach work for developing scientific tools? We've already gotten amazing contributions and documentation from scientists developing the software and adapting the hardware to their needs. But it is still sometimes a bit of an uphill battle to encourage them to document modifications and improvements that they make, or in how they actually use the tools in their experiments. This touches on our implicit goal of encouraging scientists to share their methods more openly and in enough practical detail to actually help other scientists. When you’re trying to do a novel experiment in In neuroscience, there are lots of seemingly simple things like knowing which glue to use for some application, which supplier will sell a certain type of plastic tubing in quantities under 1000 pieces, or knowing how to get a small custom PCBs manufactured, that can save months of time, and this kind of detailed information is often left out in scientific publishing. Traditionally, scientists don’t automatically think of this kind of documentation as an important part of their work. We're trained to write scientific papers with pretty short descriptions of the methods and replicating the results from these descriptions is almost impossible. This is already starting to change with the rise of the open-access movement in science and the push to make raw data and fully documented experimental methods available for replication. We’re trying to do our part in this by providing access to open-source tools that are easy to acquire and by making it easy for others to share their methods. What's the next big step on this project? Over the next months, we're going to see the beta-tester labs use the tools in their day-to-day research. This will eventually lead to Open Ephys showing up on scientific publications which will really show how reliable and capable the tools are. We also expect that there's going to be a growing list of new features or tools that people might want for their work, and then it's going to be up to the community to help these scientists in making them a reality. We've already had some amazing new features appear, but neuroscience is moving fast right now and there's always the next experiment that can’t be done yet because the tool doesn’t exist yet. We also have plans to open up a small online 'store' soon that we will use to redistribute parts and supplies between labs. A lot of the supplies that we're using in neuroscience are hard to find or have to be ordered as custom jobs from machine shops that have high one-time setup costs, or very long lead times. Because of this, labs often order large numbers of parts and end up sitting on unused supplies. We hope that by sharing some of these hard to find parts we can save everyone a lot of trouble. A longer-term goal is to make sure Open Ephys can thrive independently of any particular individual. Right now, Jakob and I are doing most of the legwork, but we’d like that to change. Things are definitely moving in the right direction. We recently registered Open Ephys as a nonprofit corporation, so we can maintain a bank account that’s separate from that of our research labs. This month, we hired an official support person (Aarón Cuevas López at the Instituto de Neurociencias in Alicante, Spain). And we now have our hardware concentrated in several “hubs,” which will have an incentive to support the system internally. Because everything is coordinated through GitHub, any updates they make can be easily shared with the entire community. Have you had any negative feedback for using programs like Eagle or Solidworks (which are no open-source) for your project? Not really. SolidWorks can be annoying at times, since there’s no free edition, and their files are not backwards-compatible with older versions of the software. But there’s no open-source software that’s as powerful. In general, our policy is to always use open-source tools when their functionality is equivalent to that of their closed-source counterparts, but we’re not willing to sacrifice quality for the sake of openness. This extends to our research as well. If there had already been closed-source tools that fit our requirements, we wouldn’t have needed to found Open Ephys. It was only because our field lacked something that was scalable, flexible, and modular enough for our needs that we had to go down this road in the first place. We've stuck with Eagle for now because it's somewhat of a standard and because the free version is still sufficient for almost all the projects that we've done. There are now a few great looking free alternatives out there like KiCad, and if someone contributes in a non-Eagle format we’re going to support that as well. Any other major difficulties you've had to overcome? Right now, “open source” doesn’t have the best reputation in neuroscience. When people think of open-source tools built by graduate students, they tend to imagine things that have been hacked together for a particular project, which are not necessarily well documented or easy to modify. They are typically hesitant to rely on open-source tools for mission-critical data collection. To overcome this stereotype, we made sure that our tools looked great (first impressions are key) and were as flexible as possible (having cross-platform software was essential for this). Once they saw our system in action, people were much more willing to trust it for their research. We hope that Open Ephys will catalyze a shift in attitudes, since there are a lot of advantages to using open-source tools in science. 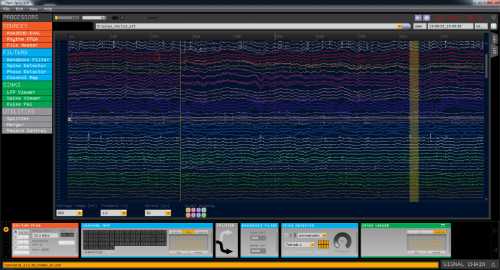 Perhaps one day, rather than spurning open-source tools, neuroscientists will demand them. How does Open Ephys differ from other open-source initiatives in the field of neurophysiology, such as OpenBCI and Backyard Brains? We love what both of these groups are doing. Their focus is a bit different from ours, so our target audiences don’t really overlap. OpenBCI is trying to make it easier for people to control external devices using brain signals alone, so it's more application-oriented that Open Ephys. Backyard Brains was designed primarily as an inexpensive teaching device, whereas our tools are aimed at replacing the expensive hardware used for cutting-edge research. Of course, any of the three could be adapted for educational purposes, consumer products, or basic research—that's the beauty of open source. Thanks to Josh and Jakob for all the great information! There’s still a lot of work to be done in the scientific field in regards of open-sourcing materials and information. Hopefully the community continues to support each other and work together. Are you aware of other unique or interesting open-source projects that could use a little support or awareness from the community? Let us know in the comments and share the knowledge! So once Google buys this out & sells all the brainwaves in the world for $50 trillion, is there going to be anything left for them to acquire, since the brainwaves that created all the stuff in the world will now have been sold. Great article/interview! It's really cool to see all the fields into which open source is making avenues. A co-worker said he was listening to a radio broadcast this morning discussing patents, specifically Elon Musk's statement exclaiming that he won't challenge any other car company that wants to use his technology. The program asked what would happen if there weren't patents? Who would want to work that hard just to have someone else take the technology? I mentioned Jonas Salk, (perhaps not a perfect example,) and discussed the open source mindset. This article certainly helps my side of the discussion. Thank you!